For both customers and implementation partners, such as CDI AG, the question arises: How can I train new employees in a goal-oriented and efficient way on a special topic such as aBPM to be prepared for upcoming implementation projects. In this blog, we would like to introduce a 2-week training and address the necessary preliminary and basic conditions from a team lead or management point of view. The current blog focuses solely on the introduction into the topic aBPM and thus on the step from the “SAP Process Orchestration Developer” to the “aBPM developer”. Our description is based on the structure of a typical SAP training (see training.sap.com). You need access to a development system based on SAP Process Orchestration 7.31 (or higher) with the relevant software components for aBPM framework 3.0 (or higher) already installed. For developing you need an appropriate NetWeaver Developer Studio (NWDS) and access to the relevant aBPM artefacts (e.g. software components (SCs), configuration files, documentation). To benefit of the full power of aBPM when integrating SAP Business Suite components, it is also necessary to have access from this development infrastructure to an existing SAP ERP system for instance. Within 2 weeks you should get a good understanding of the concepts and tools of aBPM. You will develop your first aBPM process. A sales representative will create a new customer “on the road” by entering the basic master data to start the central process. Within this process the next step will be triggered for the internal financials department to enrich this data. After an approval step for a manager the data will automatically be stored in a central ERP system. In this first practical step you should be able to implement your first start UI for the sample process (customer entry screen for the sales representative). The main tasks will be the definition of the data model for persistency and UI in the excel document and the usage of the development tools to generate and deploy the solution artefacts. After your first successful development cycle you can play around with all UI components and the attributes that affect the layout and functionality of the generated UI. In addition you will get to know some of the powerful generic UI functionalities of aBPM (value helps, eventing, validation, …). The generation of a SAPUI5 user interface from the meta model is a main part of the solution but the integration into a full blown business process makes aBPM to an even more powerful solution for a developer. After creating the start UI you will learn how to integrate the aBPM artefacts into a SAP BPM process (data types, event triggers, task UIs, context mappings, …). Additionally you will learn more about implementing actions for the UI which will affect the process flow, make use of different visibility settings to implement different process roles and further more. Most BPM solutions will face very similar business requirements. Therefore the aBPM solution will provide a lot of generic functionality for implementing such requirements. At the end of week 2 you will learn how to benefit e.g. from the built-in process cockpit feature for monitoring processes and implementing simple analytics functionality or from generic email, PDF generation or attachment functionalities. Within this second week you will also get more familiar with the complete development cycle of an aBPM solution (developing and maintaining). 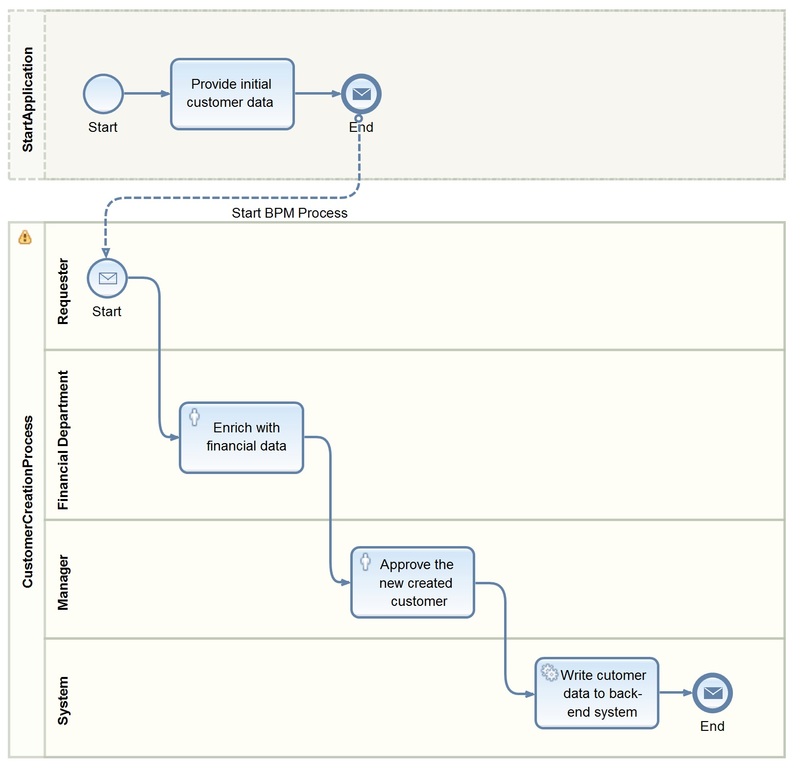 After these 2 weeks you should be able to implement a full blown aBPM process on your own. Although we tried to setup our aBPM training at CDI AG as a self-paced and self-educated training we recommend to select a more integrated approach by setting up a coaching model. We find out that it is not necessary but a lot more efficient to have an aBPM expert by your side and train the solution e.g. during a prototype or a well-defined proof-of-concept project supported by aBPM consulting services from SAP or an implementation partner.